Please check back regularly for our upcoming retreats. We have something for everyone to reconnect and spend time with God regardless of how busy your life is. Attention Trojans! We know how busy your life can be! This Lent, the USC Caruso Catholic Center is offering a directed retreat specially tailored to fit your busy schedules - the Busy Trojans Lenten retreat. This is a retreat that will help you spend time with God during this important liturgical season. The Busy Trojans Retreat will begin on Ash Wednesday, March 6 and end on Sunday, April 28. Each week you will have an opportunity to meet with your spiritual director - a priest, brother, sister, or other Catholic layperson trained to offer such direction for 30 to 60 minutes. You can meet in person or via video chat. Your spiritual director is a person who will walk with you through the Word, listening with you for the movement of the Holy Spirit and where the Spirit is leading you as you come to know God more intimately. 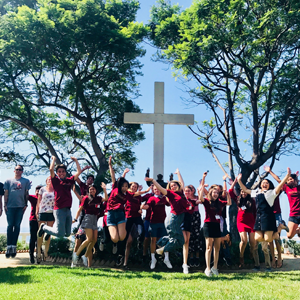 In addition to the meeting with your director, we also ask that you devote 30 minutes or more in personal prayer each day and, as your schedule permits, attend Mass on weekdays at 12:10 p.m. or 5:30 p.m. at the USC Caruso Catholic Center. There is no fee for this retreat. Know that we have limited spots for this retreat and they will fill on a first come, first serve basis. Contact Sr. Kathy via email for more information. In our prayer lives, do we spend too much time talking to God, as though by multiplication of words we could attract God's attention to our prayers? How often do we quiet ourselves and really try and let God speak to us? This silent retreat, beginning on Friday, March 29 and ending on Sunday, March 31, is your opportunity to listen for God's voice in your heart and life. Students who have made this retreat in the past enter the experience with a lot of nervous energy, but by the end of the weekend, they all are craving more silence in their lives! You will have plenty of opportunity to relax and sleep, as well as to speak with an individual Spiritual Director, who will help you tailor the experience to your unique needs. Don't let the fear of not talking keep you from this amazing experience of sacred silence! Note that we will be leaving from Long Beach on Friday morning, in order to travel to USC's beautiful facility on Catalina Island! Contact Fr. Greg via email for more info!